Less Reading = More practice! 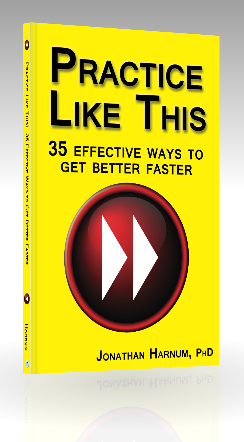 Tightly packed with the very best strategies, mindsets, and practice hacks, so you don't waste time reading, but get right to the good stuff. Most topics are covered in a page or less. All killer, no filler. Now as an audiobook! ​When you buy the book, you also get a FREE, full-color, hyperlinked PDF. Take it everywhere. The strategies in Practice Like This are powerful, drawn from psychology, biology, educational research, and from world-class professionals in many fields. Learn more about what's inside here. Practice Like This makes a great gift for anybody trying to get better at anything. Whatever your passion is, you'll find this book useful. Don't forget to check out the book extras page. Specialized editions or excerpts can be made to order for your team or organization at no extra charge. ﻿Contact ﻿Sol Ut Press for details. The images below are licensed under a Creative Commons Attribution-NonCommercial-ShareAlike 3.0 Unported License. Share 'em all you like, but give me credit with a link or a shoutout. Thanks!